"Can I drop by to buy a bottle of eye drops from you?" the lady phoned me on this cloudy Sunday morning of February 3, 2013. "I think my cat's eye is infected and my vet prescribed eye drops and she recovers. After a while, her eye has discharge again." She had consulted two vets and they prescribed eye drops which was "effective" for a while. "I am sorry I can't prescribe without examining the cat," I had confirmed that I had not treated her 7-year-old female spayed cat previously. 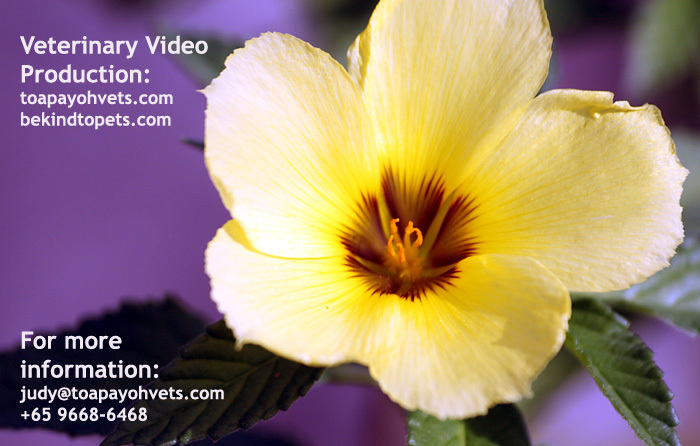 "Your cat's eye may be ulcerated or be infected and this is hard to confirm without examination. Why don't you go to your vet to get the eye drops?" "My vet is not opened today," she replied. Many Singapore pet owners prefer to get repeat medication without review of the pet's condition and this is not in the interest of the pet. The lady brought her cat in to my surprise. A general examination VIDEO showed that the medial side of the right eye was swollen at the eyelid. Pus and discharge rolled down this bump. "There is an inrolling of the eyelid at the medial canthus," I pointed my iphone App "torchlight" at left eye and then at the right eye. My regular torch-light was not so bright but this iphone App "torchlight" never fails to shine brightly (IMAGE OF IPHONE APP PHONE). "I am surprised that my cat permits you to shine such a bright light for so long," the lady said. The cat soon growled and that was the end of the examination. 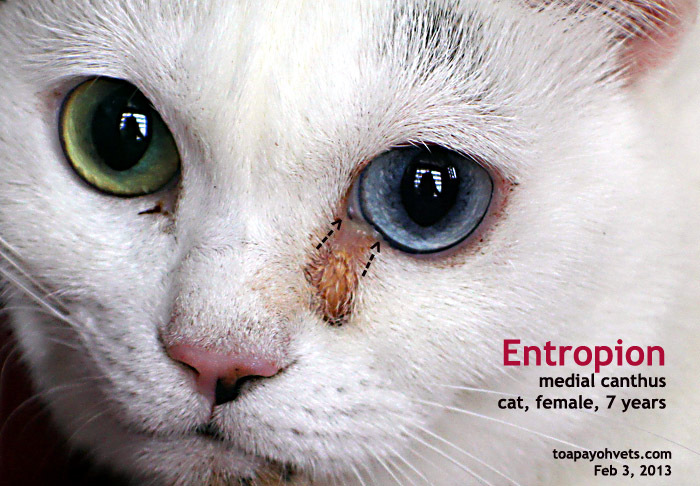 "The diagnosis is medial entropion of the cat's left eye", I said. "What's the treatment," the lady in her 30s asked me. "Surgery to roll out the eyelid is a permanent solution," I sketched an illustration (ILLUSTRATION OF ENTROPION SURGERY). "No way. My cat is so old," the lady preferred the eye-drop solution." "I presume this right eye tearing starts when the cat was a kitten and for the past 7 years," I speculated. "No," she replied "Not for the first 2 years as a kitten. I distinctly remember as the kitten was with me in China." "This is a rare case of acquired entropion," I don't expect the lady to understand technical terms. Acquired entropion means that the eyelid rolls inwards later in life as contrasted to congenital entropion which is present from birth. "This entropion is very rare in cat," I said. "I would think that your two vets would diagnose an eye infection and the eye drops with steroids worked very well. It is quite common in some breeds of dogs like the Shih Tzu and bulldogs. The permanent solution is surgery." If no surgery is done, the chronic conjunctivitis will cause dry eye and the nostril discharge (see the image) will continue. It is best to diagnose correctly and get the entropion done early so that the cat does not suffer from eye infection and keeps on rubbing her eyes every day for the rest of her life. Eye drops with steroids are not a treatment option as they only alleviate the signs and symptoms.